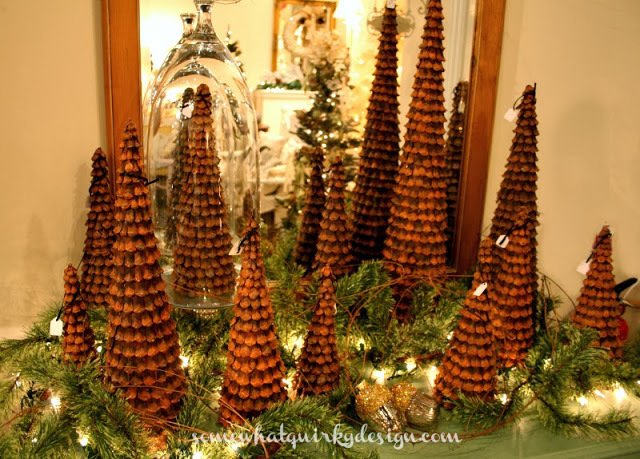 These are Christmas trees, or not Christmas trees, that I made from pine cone bracts. I'm a fan of the pine cone. I never see one that my mind doesn't start imagining making something with/from it. No pine cone is safe when I'm around. 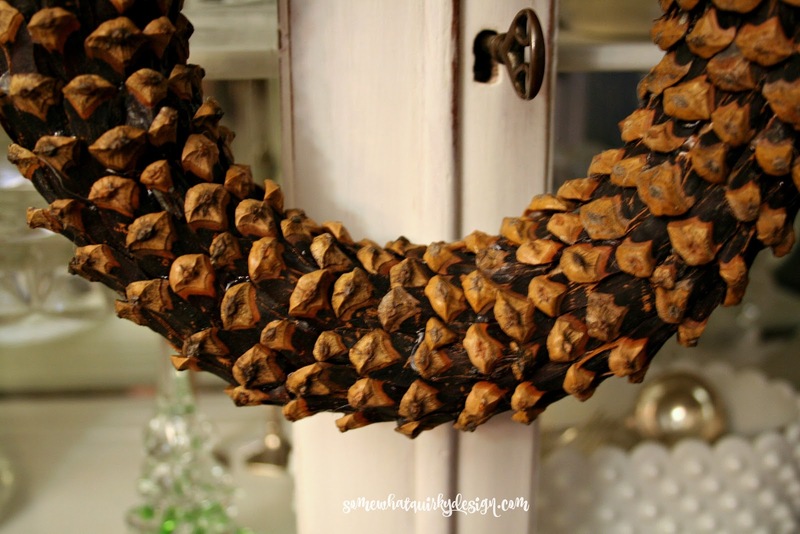 If you visited my Christmas home tour you saw several of the things I've made from pine cones over the years. And if you haven't visited, well I would love for you to stop in and see some of the Christmas decor in our home this year. I mentioned in that post that I had a couple of other projects that I would show you this week. I know you're going to want to make one. Collect a bunch of pine cone bracts. 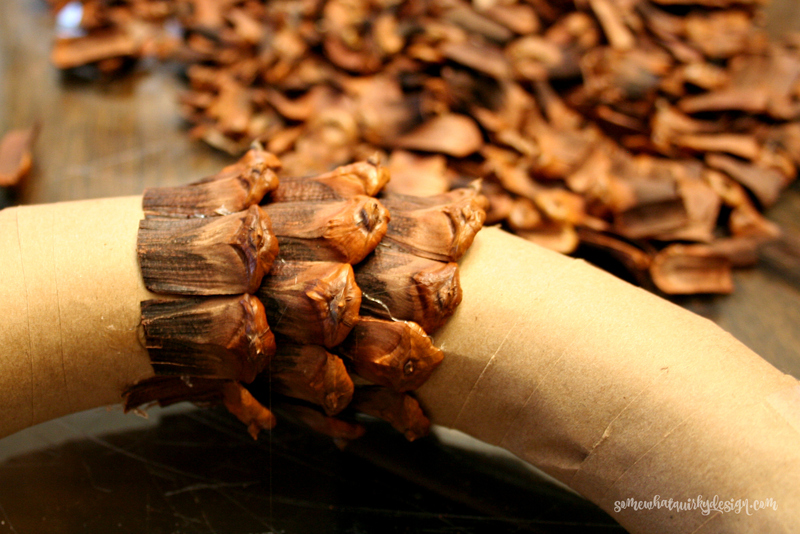 Pine cone bracts are the "leaves" of the pine cone. You can see how I get those off the pine cone here. 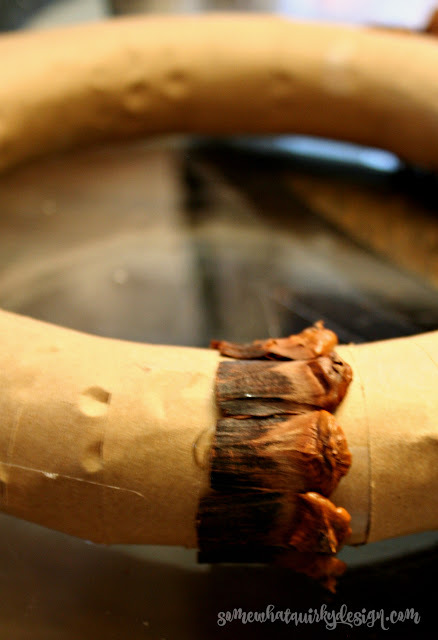 Get your hot glue revved up because you're gonna us a lot. Cut up a grocery bag into 1" strips. 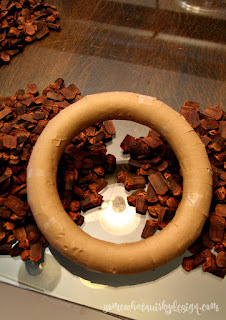 Wrap those around a styrofoam wreath form in your choice of size. Keep wrapping until the form is completely covered in brown paper. You can just use tape to connect the strips. 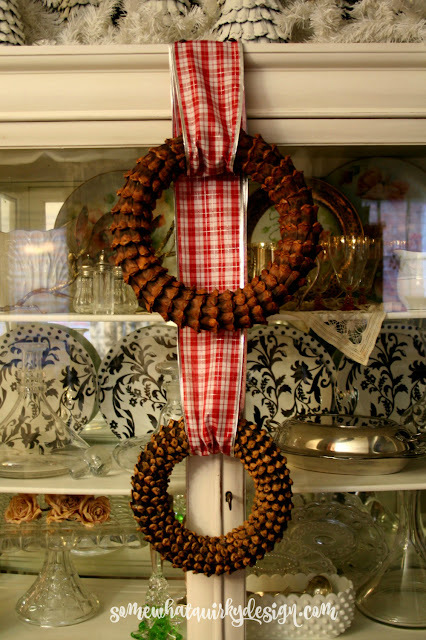 Note: I used a 10" wreath form and a 8" wreath form. Covering the wreath is very much like making the trees. Except. There is one little trick that you have to consider because the inside of the circle is smaller than the outside of the circle. To adjust for this you simply use the longer bracts on the outside of the wreath form and gradually use smaller ones as you move toward the inside of the wreath. Then just keep adding layers until the wreath form is completely covered. 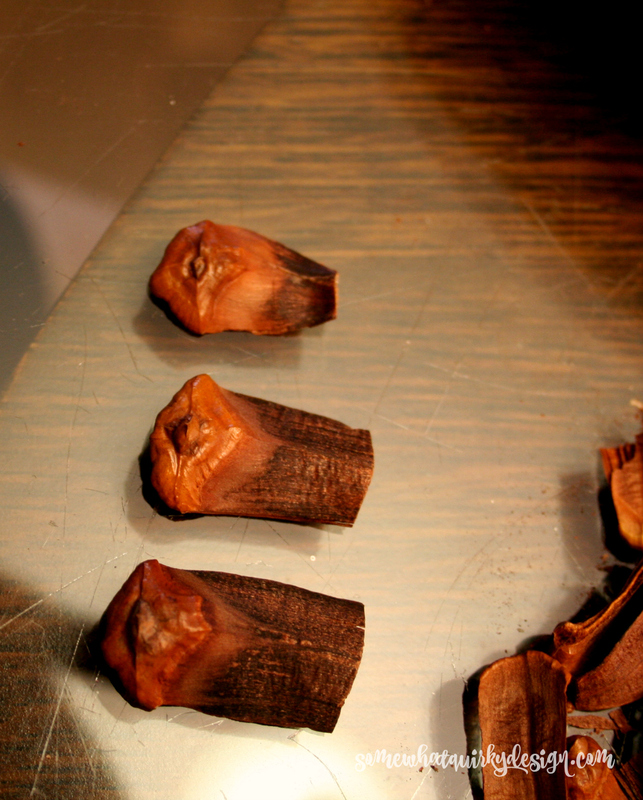 When you get to the last row you will need to tuck the base of the bract under the first row that you glued in. It wasn't so easy to do the one I made with the little bitty pine cones. That big cone is a smallish version of what I usually do for the trees and what I did for the larger wreath. They had this very interesting coloring that I thought would be really pretty. They are so small that the color wasn't as obvious as I hoped, I'm not sure that the color is worth the effort it takes to tear apart the smaller cones. It's hard. They are just the perfect size for my china cabinet. They would also be great on indoor windows or mirrors. Have you made any cool stuff this season. Oh! and this is IMPORTANT! 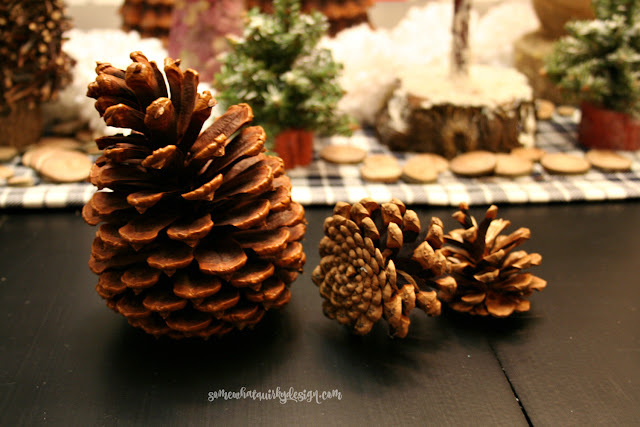 hometalk.com and countryliving.com are working together to celebrate what we bloggers do to make our homes special for our families at Christmas time. Stop in and see all the special things they have in store! Absolutely floored! I can't believe the patience you had on this one, but every second was worth it. The outcome is so outstanding! Thanks for sharing your gorgeous wreath! 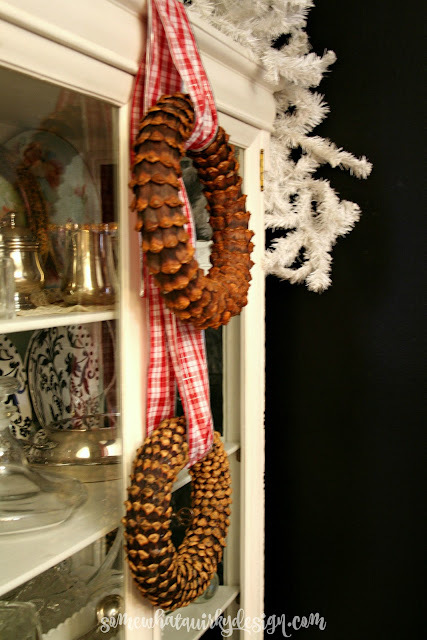 Oh goodness I love pinecones also, and may just have the patience to do a one sided wreath. Thanks for the inspiration. Very cool, I've never seen that done before!! I love this, and I'm going to try my own. Your link to the directions for removing the bracts doesn't seem to work, though. Can you repost the link? I bet crafting these beauties took a lot of patience! article. It was funny. Keep oon posting!